Place cooked grains and drained garbanzo beans in a large bowl. Add corn, tomatoes, greens, green onions, and bell pepper to bowl. Slice the basil for the dressing. Measure out ingredients for the dressing into a jar. Cover the jar with the lid and shake to blend. Pour the dressing over the top of the vegetables and grains. Mix well to combine. Hobbies & Interests: Hiking, biking, going to the beach, and traveling in our camper. Also reading, New York Times crossword puzzles, table setting competitions, and taking my mother out to find the very best cinnamon rolls available. Favorite Local Activity: Entertaining – my similarly-minded friends and I started a cookbook club where we gather with friends and family for a bi-monthly potluck to cook from and review interesting cookbooks. 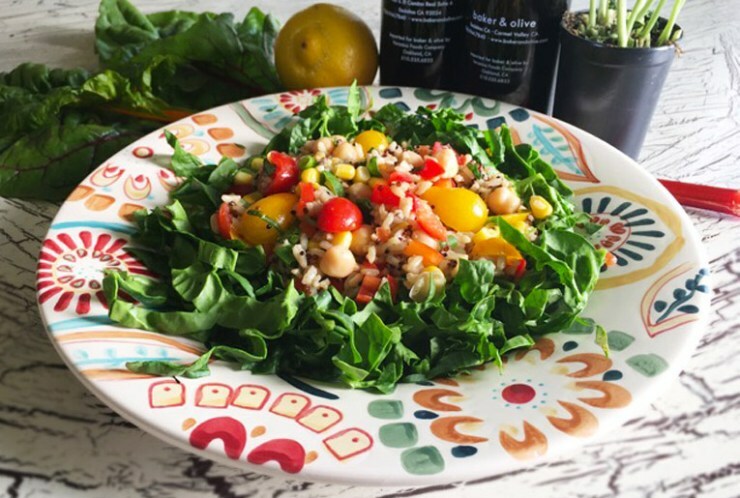 About the Recipe: Greens and Grains is a recipe developed by my friend and former colleague, Melinda Bustos. 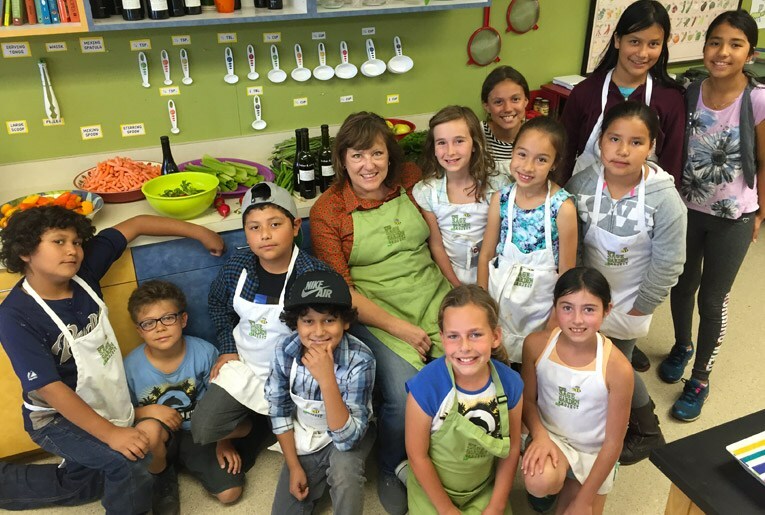 At Sage Garden Project at Ocean Knoll Elementary, our team is inspired by the produce grown by students in the school garden under the supervision of my coworker, Karen Saake. We bring the organic produce into the nutritional science lab on campus and cook together, teaching students and their families to prepare fresh, healthy meals. This recipe is a great side dish and transitions to the next day’s lunch very well, especially if made with sturdy greens such as kale. About the Chef: After years in the advertising business, I transitioned into the food industry. Being blessed with a father and child who were notoriously picky eaters laid the groundwork for my current rewarding career as program director of Sage Garden Project, nurturing children into adventurous eating and encouraging a lifetime of optimal health.